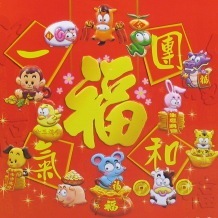 The traditional Chinese Zodiac features 12 animals, each believed to bestow their characteristics to those born in their year: The Rat (鼠), Ox (牛), Tiger (虎), Rabbit (兔), Dragon (龍), Snake (蛇), Horse (馬), Sheep (羊), Monkey (猴), Rooster (雞), Dog (狗), Pig (豬). This is a horoscope for the Year of the Pig. Pigs work hard so that they can enjoy the best things in life. They live a good life, and like to share their good fortune with those around them. They can concentrate well, and when they set their mind on a task, they pursue it until it is done. While Pigs will seldom ask others for help, they would never refuse to help others in need, but their trusting nature can mean that they might be taken advantage of by others. According to Chinese astrology, it is believed that you are more likely to offend the gods in your own zodiac year, which means that you are more likely to suffer bad fortune. Pigs should be more careful during this year, for example; taking care when handling sharp objects to avoid unexpected injuries, and to pay closer attention to your health. The Year of the Pig will be joyous and full of promise. The mood will be happy and buoyant, which means that if you don’t keep an eye on your finances, you might find yourself in a spot of bother. Take time to consider your actions and you should prosper and do well. The Year of the Pig is not a year in which to take risks. Make sure you sweep and clean your house before the New Year and not during it, as you don’t want to sweep out your good luck! Eat together with family and friends at a reunion dinner at the end of the year. Eat lucky-sounding foods, such as large mandarin oranges and fish to ensure that you have luck and wealth. Wear bright coloured clothing (preferably new, and red) to scare away evil spirits. Want to learn more about the traditions and folklore surrounding Chinese New Year? Find out how the Pig ended up twelfth in the Chinese Zodiac!